Post Acne Scarring can be Fixed! Long term cystic acne can result in both pigmentary and textural scarring. While most pigmentary scarring will fade over time, textural scarring can be permanent. For many patients, the long term uneven appearance of the skin is just as distressing as the acne breakouts themselves. Textural acne scarring occurs when inflammation recurs repeatedly in the same areas causing breakdown of the collagen and elastin in the skin. Most commonly, textural scarring is atrophic or indented. There are three types of atrophic scarring – ice pick, boxcar and rolling scars. Fortunately, there are various resurfacing procedures available to improve the appearance of textural scarring in all skin types. Skin resurfacing can be done with laser energy or manually with micro-needling. The concept is similar – the scarring is broken down incrementally in microscopic columns which then stimulates the body’s natural healing response to regenerate the tissue in a more organized fashion. Fractional lasers can help remove surface imperfections and significantly reduce the appearance of scarring. There are two general types of fractional laser resurfacing, ablative and non-ablative. Ablative lasers work by vaporizing the outer layers of skin while non-ablative lasers work beneath the surface of the skin by heating tissue. Ablative lasers are generally more effective but require more downtime and have a higher risk of side effects. Non-ablative lasers have less downtime and less risk, but require a series of treatments. Micro-needling with PRP (platelet rich plasma) is a revolutionary resurfacing procedure that uses an electric pen with multiple tiny needles on the tip. This device goes over the skin surface causing micro-pores/channels which stimulate the skin to regenerate collagen/elastin. PRP is a clear, gold fluid extracted from the patient’s blood with a special centrifuge. A high concentration of activated platelets in the PRP release growth factors that recruit and increase the proliferation of the reparative (healing) cells of the body. PRP can be applied to the skin and driven into the scarred area using the microneedling pen. The needling itself breaks up the scarring while the PRP naturally augments the healing response. There is minimal downtime and risk of side effects. Most patients require a series of treatments for best results. 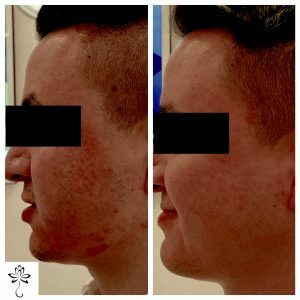 Spring Street Dermatology offers fractional ablative resurfacing, two types of non-ablative resurfacing and microneedling with PRP to address textural acne scarring. A treatment plan, using one or multiple modalities, is formed by taking into consideration patients’ goals, skin type and depth of scarring. The final step in the long battle with acne is to improve the leftover scarring – fortunately there are various effective procedures that can help!